A few years ago the most adorable girl was referred to me. I call her a girl because the cutest 5′ creature showed up. Within moments the shy Monika asked me if I thought she could do a “BIKINI” show! She was a stunning tight little package but scared and shy. Confidence and stage presence were the only requirement. She conquered her fear and rocked the bikini walk. She has always been motivated to “train insane” all alone. Nutrition has never been an issue. Our path was strictly about stage presence. Our journey wasn’t that of a coach and client for too long. She mastered the posing quickly. I was there at the beginning of her journey. 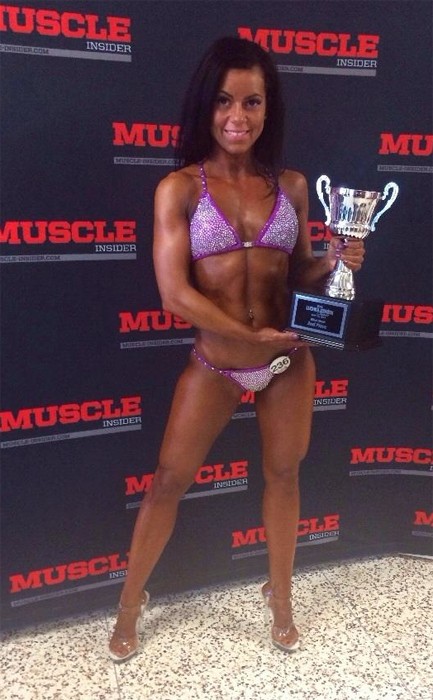 I am thrilled that my one time client has blossomed into a BIKINI DIVA who continues to compete. May 3, 2014 I was there live to watch pre judging. I was Ecstatic to learn my prediction of placing second came true later that night. Aside from being beautiful on the outside she has a heart of gold. Her creativity and talents have allowed her to develop a new business. The last 2 shows she has worn her own creations. She is busy filling orders for the 2014 season for others. So next time you hear someone yelling” peanut”… that’s me!! Staying in touch! Yelling loudly! Monika or “peanut” is an up and coming superstar on a quest for her IFFB pro card.